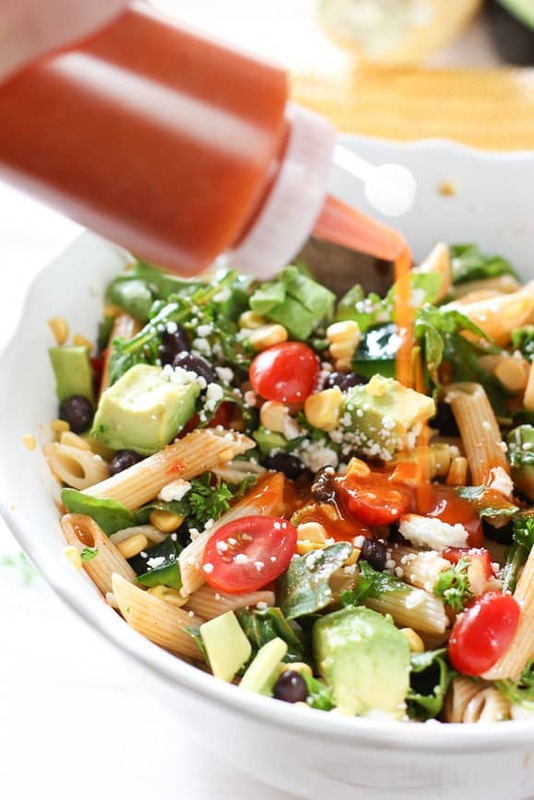 Tex Mex Pasta Salad with Chili Tomato Vinaigrette! 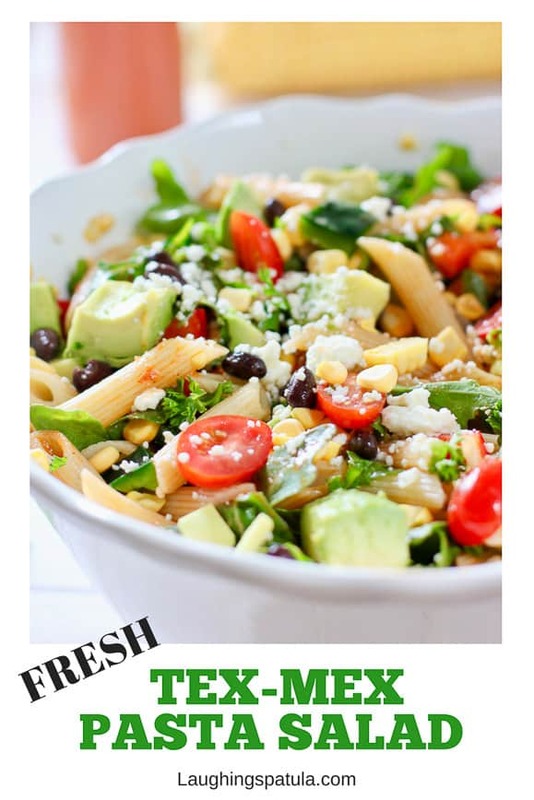 – Fresh crunchy corn, black beans, avocado and a plethora of veggies tossed with pasta and a flavorful easy to make vinaigrette! Love me some Tex Mex flavors! Black beans, peppers, corn and of course our good friend avocado! We went heavy on the veg for this recipe. You can’t have too many veggies! 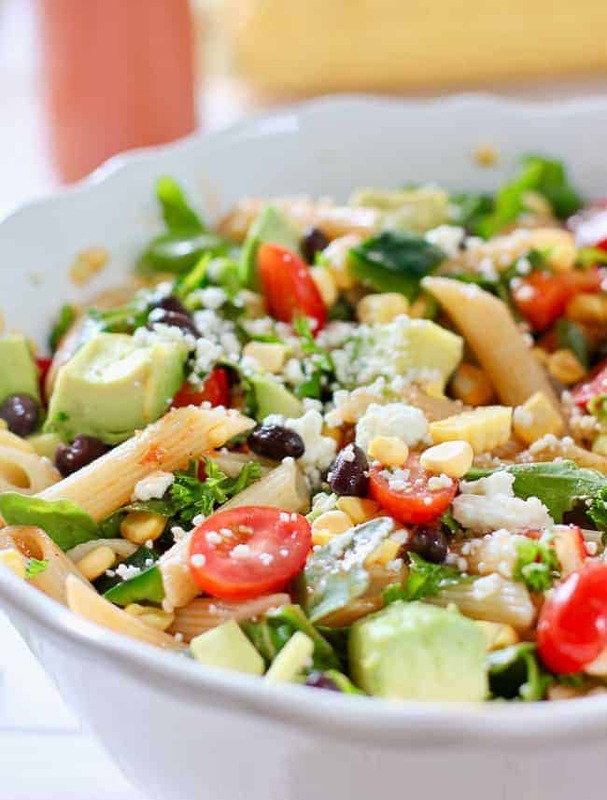 To keep this Tex Mex Pasta salad with Chili Tomato Vinaigrette FRESH – Toss the avocado and arugula in right before serving! I used penne pasta which holds up great on on warm summer days. But any pasta shape will work. Same goes with veggies …. carrots, garbanzo’s, cucumber and more would be great in this super fresh salad! I wanted wagon wheel pasta but couldn’t find them. Was there another shift in the universe that I missed. No wagon wheel shaped pasta anymore? The vinaigrette is super simple! Fresh tomato, garlic, olive oil, vinegar and a pinch of cumin and chili powder. I whirl it all up in my little blender. Its the only electric gadget (beside my Kitchen Aid) that I use all the time. A food processor would work, as would an immersion blender . It only takes about 3-4 minutes to make, and is well worth the extra few minutes. Gets a nice little kick from the chili powder for added Yee Haw! 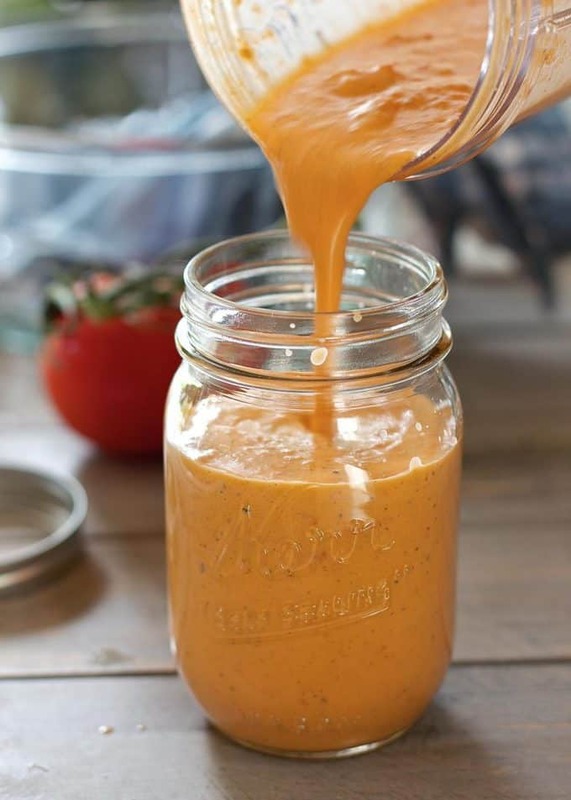 CHEATER TIP: Add a teaspoon of cumin and two teaspoons of chili powder to store bought Italian Vinaigrette or any other light dressing to make a flavorful Tex-Mex dressing. I do so love those little chef squirt bottle dispensers! Equal salad dressing distribution every time! 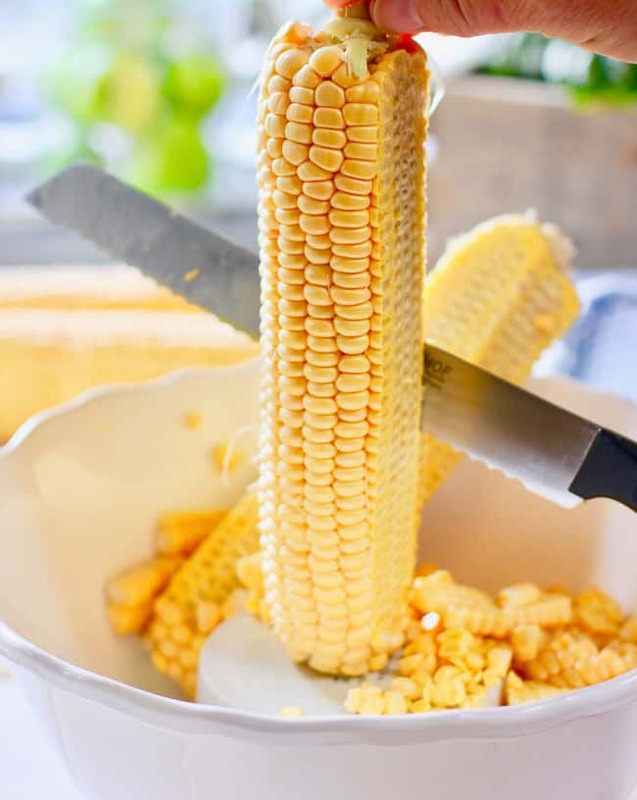 We used fresh corn, shucked right off the cob add some extra crunch! COOKS TIP: invert a small bowl into a large bowl. Stand your corn on it and shuck folks, it all goes right in the bowl and not all over the floor! I tossed in a chopped poblano pepper which I seeded and deveined. Most of the heat in peppers is located in the middle. You can easily sub a green bell pepper as well if you want to avoid any heat at all. Serve this up with a sprinkle of Cochita cheese (or Feta which is a great substitute), and munch on it all week long! 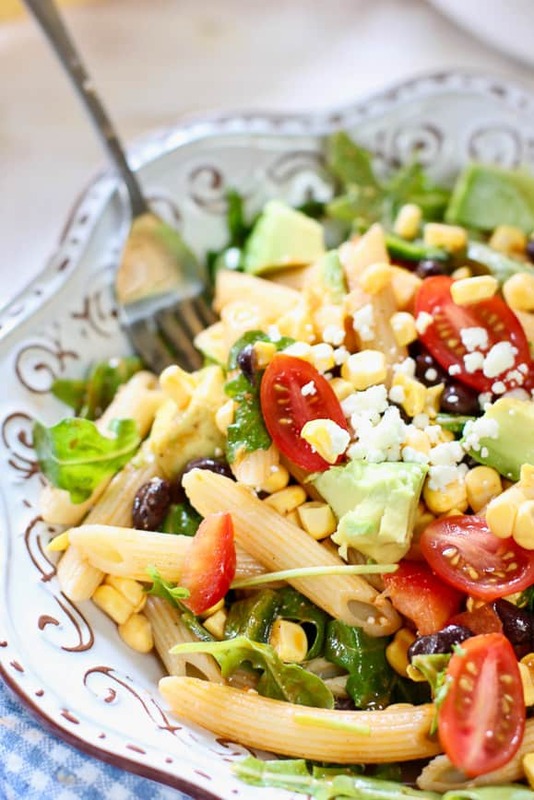 Another of our favorite salads is Corn and Avocado Salad with Honey Lime Vinaigrette! The vinaigrette keeps the avocado green and the honey adds just enough sweetness to the corn. All of these salads would go really well with our Easy Salmon Burgers with Avocado Salsa! You can see all of our salads HERE! It’s may be raining in Seattle but my tummy is full of sunshine ! 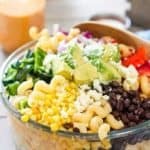 An easy to make pasta salad with all the Tex Mex Southwest flavors we love! Includes a easy to make Fresh Tomato Vinaigrette recipe. Bring large pot of water to a boil. Cook pasta according to package directions. Drain and rinse. While pasta is cooking, prepare dressing by combining all ingredients in a blender or food processor for 10 seconds or so until well combined. (taste for salt, pepper, seasoning). Pour into jar and store in fridge until ready to use. Combine cooked and drained pasta with prepared veggies. Top with dressing and mix. You will not need all the dressing. Save what you don't need to dress up the leftovers! Taste for seasoning! More salt, pepper? Nutrition information is for a heaping cup of salad with 2 tablespoons of dressing. Thank you for the nice note Laura! 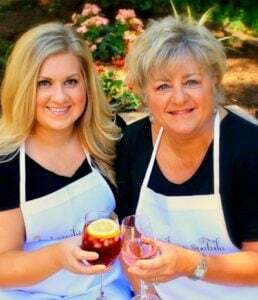 We are so glad you liked it! Has anyone checked for how many weight watchers points this recipe would be? I just started the program but I LOVE this recipe!!! I came to your site looking for something healthy to eat for dinner and this recipe got my heart beating faster (that’s a good thing, right?)! So I am off to the store to get some poblanos (hopefully milder than yours). Pinned. Thanks Sue! You might consider an anaheim pepper too! (you probably know that…your a pretty good cook yourself :).